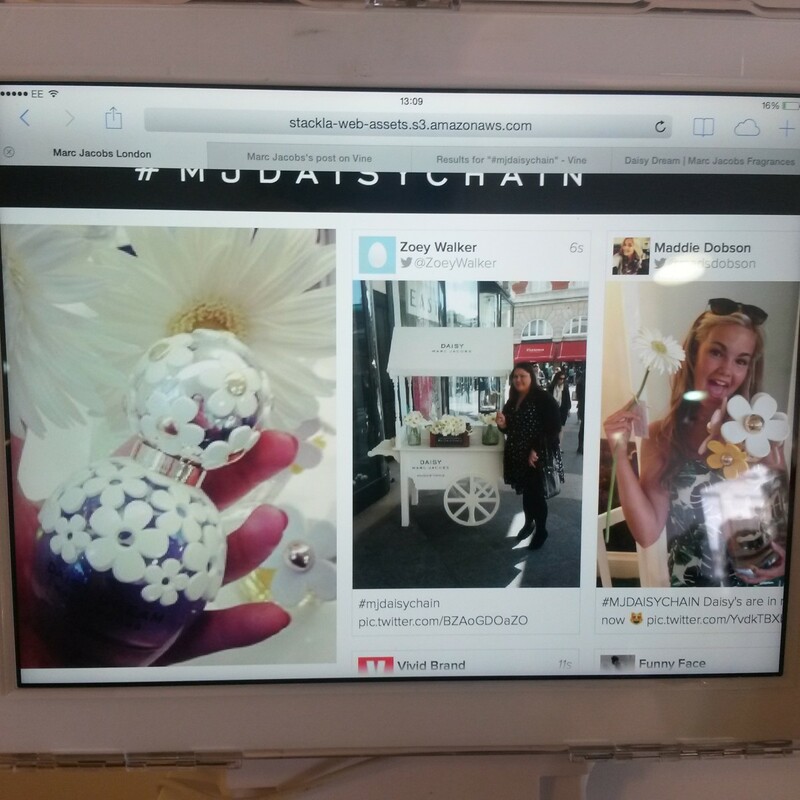 What is it like to attend a pop-up event in a Twitter Shop? First of all, a massive thank you to everyone who joined the first ever #EventPlannersTalk on Twitter yesterday where we discussed ‘How to Promote Events using Social Media’? So many interesting insights and thoughts on the topic were exchanged during that hour and I can’t wait to host the next one on 15th September where we’ll discuss sustainability and green events. Talking already about social media, it’s a good opportunity to share with you my impressions from the Marc Jacobs pop-up ‘tweet shop’ that took place last weekend in Covent Garden, London. After the successful campaign in New York, London was chosen to host the event. How did it work? They set up a pop-up shop for three days to promote the Daisy Marc Jacobs fragrance and customers were encouraged to use the hashtag #MJDaisyChain instead of cash to get a sample of the fragrance. In addition they had a DJ, coffee station, nail bar, lounge, Vine booth and Twitter wall. That was a B2C event and in general I enjoyed the idea and the experience. B2B events can learn from this case study how to engage with their audience on social media. There are only two things in my opinion Marc Jacobs could have done better. Firstly, why only tweets? They could encourage the customers to Facebook, Instagram, YouTube and so on the campaign and gain larger brand exposure. Some people may have even more followers on other platforms than Twitter. Secondly, the brand didn’t interact with me. When I tweeted the hashtag no one from Marc Jacobs liked nor retweeted it, nor replied and welcomed me to the store or thanked me for coming. I just found it a pity that the brand didn’t engage with potential or existent customers, while they have them already in the store, using their products. If you had the chance to attend the event I would be happy to hear your thoughts and experience and feel free to share impressions if you came across similar campaigns in the past. How to promote events using social media? How to Get a Job in the Events Industry?